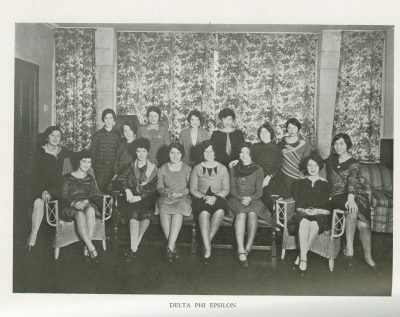 Delta Phi Epsilon was founded at New York University Law School in New York, New York, on March 17, 1917, with the motto “Esse Quam Videri,” or “To be rather than to seem to be.” It was formally incorporated under the laws of the State of New York five years later, on March 17, 1922. Delta Phi Epsilon’s colors are purple and gold. Penn’s Nu chapter of Delta Phi Epsilon was founded on March 17, 1925, and was active until the late 1960’s.